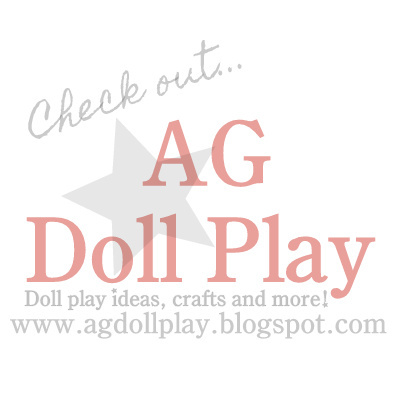 American Girl Doll Play: How to Make a Diving Board for Your Doll! How to Make a Diving Board for Your Doll! Seeing Amanda's post the other day about her dolls having some fun in the water boating made me think about swimming and how our dolls haven't been able to go to the beach yet due to the excessive rain that we've been having here lately. So, Zoey and I decided to go to our dollar store and Ace Hardware and get supplies to make a pool and diving board for the dolls! Scrap pieces of wood as pictured, two thin pieces that will be the board and then three blocks to stack on top of one another for the base of the diving board, duct tape, a large plastic basin/tub for the pool, nails, hot glue and glue gun. First you will want to hot glue your three pieces of block wood. These will be the base of your diving board. Then hot glue your two thin, long pieces together as well for a little more durability so your dolls don't weigh it down too much when standing on it. Now, using your duct tape, start covering your base with tape. Do the same with the plank or diving board. Now, nail your board to your diving board base so that it is secure. I don't think hot glue would be enough support for this step so if you need to ask a parent to help with hammering than please do so. Here is your finished diving board! I think we are actually going to decorate the sides of our board with some fun summer themed stickers but this is what it looks like right now. We couldn't wait to play with it so got the dolls in their suits and their towels ready so they could test out the water right away! They LOVE their new pool and diving board!! Summer friends are the BEST friends! Thanks Amanda for the inspiration from your previous post! I love the lifeguard chair too! Did you find the 'pool' at the dollar store? Yes! The pool was on the far back wall on the dollar side of Ace. Where did you get that orange swimsuit?